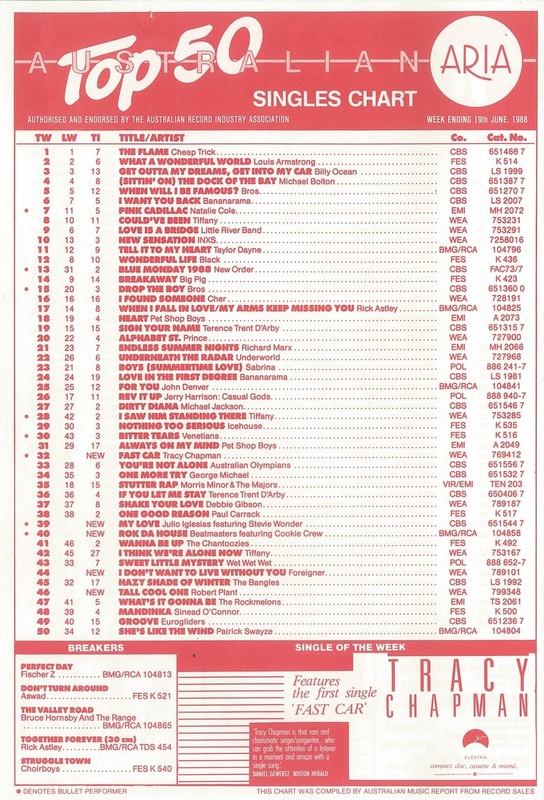 This week in 1988, it was one of those times when pretty much anything went on the ARIA singles chart. Cheesy ballads rubbed shoulders with house music and folk, and no one thought anything of it. 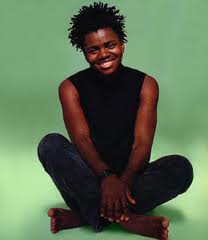 Tracy Chapman had good reason to grin in 1988. Well, I wasn't too happy with the folk part - especially since that song turned out to be the biggest of the week's new entries, but you can't have everything. At number 1, Cheap Trick's "The Flame" held on for its third (of four) weeks, keeping Louis Armstrong from claiming a long delayed chart-topper for yet another week. Stylistically similar to Jimmy Nail's "Ain't No Doubt" (without being anywhere near as big), this half-spoken, half-sung single came from The Band guitarist's debut solo album. He'd almost topped the ARIA chart five years earlier with "Electric Avenue", but despite this anti-apartheid song being a top 10 hit across Europe, Australia didn't get on board. The chart performance of this synthy single resulted in it being left off upcoming album Bondi Road and may have been the reason Dragon opted for a more mainstream pop/rock sound on follow-up "Young Years". I quite like "Heaven Knows", the first single from the Led Zeppelin frontman's solo album from 1988, Now And Zen - I even downloaded it a year or so ago. But, until I saw the name of this follow-up on this chart again recently, I had completely forgotten about this song. Sounding almost like something Billy Idol might have released, "Tall Cool One" is not too bad, but it didn't get any further than this debut position. In 1985, soft rockers Foreigner had one of the biggest hits of the year with mega-ballad "I Want To Know What Love Is". This track, taken from their 1987 album, Inside Information, was pretty similar in style (without the big choir sing-along at the end of the track), but ended up peaking much lower. It would also be their final Australian hit. This track, a number 5 hit in the UK, popped up as a Single Of The Week at the bottom of the chart a while back, and finally made its top 50 debut this week in 1988. It wouldn't get much higher, but it was nice to see a massive dance track crack the chart when so many other club hits from 1988 (Inner City, Bomb The Bass, Jellybean) failed. Songwriting and production trio Beatmasters would follow this song up with a slew of great tracks over the next couple of years (and be responsible for launching Betty Boo onto the world), while Cookie Crew were a female rap duo we never heard that much from again. It really was a different era when Spanish crooner Julio Iglesias could score a top 40 hit! Although "My Love" didn't get any higher, it did mark his first appearance on the Australian singles chart since his trio of hits in 1984, which included two other duets: "To All The Girls I've Loved Before" with country star Willie Nelson and "All Of You" with Diana Ross. He may only have had a handful of charting singles in Australia, but Julio scored regular album success throughout the '80s, '90s and '00s. The week's highest new entry was this debut single from Tracy's self-titled debut album. "Fast Car" would go on to be a massive worldwide hit - reaching the Australian top 5, and the top 10 in the US and UK. For me, Tracy was 1988's Sade (with a social conscience) - she sold truckloads of albums that were played in shops and cafes all year, and I flicked the channel every time the song came on the TV or radio. And it came on a lot. Obviously, a lot of people love the song and Tracy is a talented artist - I've just never been that into her. Next week: it was a new era for the ARIA chart with some big changes made to everyone's favourite top 50. Before that, I'll conclude the countdown of my favourite songs from 1994. 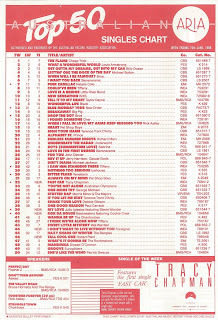 Love Rok da House - one of my favourite songs of 1988 (if only I hadn't thrown away those ARIA charts and my own year end charts a few years ago, I could tell you exactly where I placed it - but definitely in the top 10 for that year). It didn't get the recognition it deserved in Australia, but that was part of a wider issue for the dance genres that you have mentioned previously. My friends would use the term 'house music' to mean anything and everything in the 1990s, but as far as I'm concerned, this track is authentic (UK late 80s) house, and my favourite example of it. The Robbie Robertson track is, as you say, stylistically similar to the Jimmy Nail song. She who seems to appear on umpteen random projects, Maria McKee, appears in the video. I hadn't heard 'River' until looking for the video a couple of weeks ago. It's quite a decent song that should have done better. It almost sounds like Talking Heads, at least vocally, to my ears. Pretty sure I haven't heard the Foreigner song since 1988. The post-chorus/verse music sounds like Phil Collins. I saw on a YouTube video interview from more-recent times with Cookie Crew that they only did 'Rok Da House' as a kind of favour (or the record company talked them into it). The Beatmasters were music for TV programs/commercials songwriteres/performances, and ‘Rok Da House’ was originally intended to be used as a theme-song for something (if my memory is correct). The Cookie Crew don't like the song, and think it's too commercial-sounding. Subsequently, they refused to appear in the video or to perform the song 'live' on Top of the Pops (much to the dismay of both the show and the record company), because they felt the song didn't represent what Cookie Crew were about. That being said, I happen to like the song a lot, and think the retro cartoon/stock footage works well for the video. If it's not blocked on YouTube, I have a music video for 'My Love', but couldn't recall how the song went. I one of the people who love 'Fast Car'. I didn't mind it at the time, but grew to like it more later on. I was thinking the same thing about the Dragon song sounding a bit Talking Heads-ish. For some reason I seem to remember My Love featuring some beach scenes? Unless there's another video, the one I have for 'My Love' features shots of Julio (and only him) walking between tall pillars of some grand building, interspersed with scenes from a riverboat somewhere in East Asia. For anyone wondering, it is blocked on YouTube.